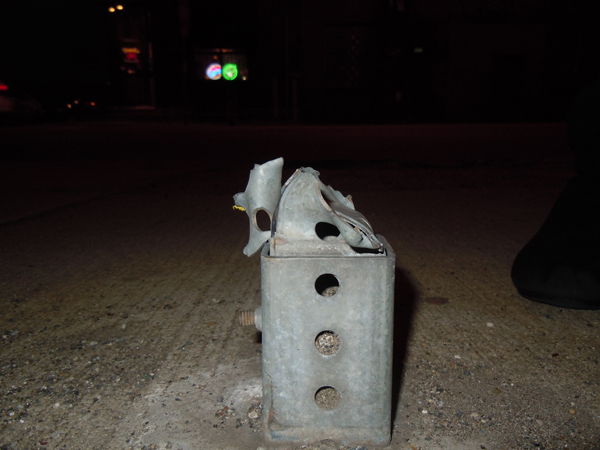 You see them scattered around the city — the metal stumps of felled street signs, jagged leftovers of someone’s errant driving. Though they’re sometimes just a few inches high, they can catch a passer-by’s foot and send him sprawling more efficiently than a bowling ball knocking down pins. Out-of-control cars and trucks knock down traffic signs in Philadelphia on a near-daily basis. Breakaway signs, which topple but leave a “pole stump” in place where workers can reattach a signpost without breaking up and replacing the concrete around it, have become an industry standard because they cause fewer crash injuries and are cheaper and quicker to repair than unyielding, rigid signposts. But like any quick and cheap solution, this one has problems: The city has paid out nearly $1.1 million in the past 18 months to settle 20 lawsuits filed by pedestrians who tripped over pole stumps and suffered major injuries, according to city records. And we’re not talking stubbed toes and skinned ankles. 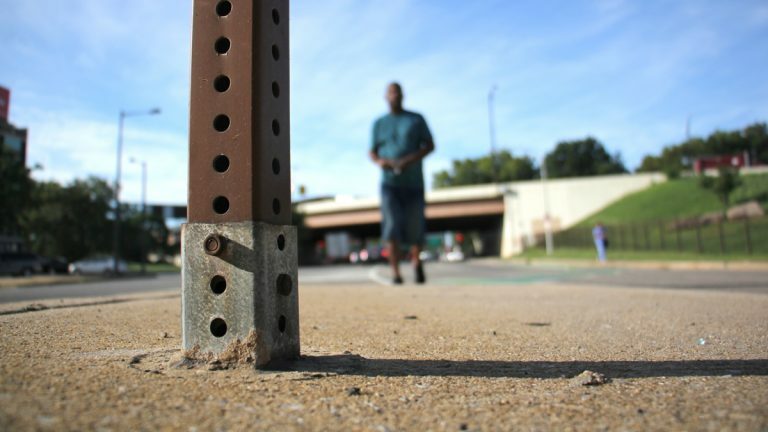 When Walter Mazur went jogging near his Port Richmond home in March 2012, he didn’t notice the pole stump sticking up from the middle of the sidewalk at Richmond and Tioga streets. His sneaker caught on the ragged stump, hooking him like a fish, his attorney Leonard G. Villari said. Mazur then instinctively tried to hurdle whatever it was that snagged him, but instead just catapulted himself full-force into the sidewalk. It was a tragically ironic incident for a man dedicated to safety: Mazur worked as a fire inspector, checking alarms and extinguishers in buildings around the city, and had become a dedicated jogger when a doctor advised him exercise would alleviate another health problem, Villari said. Mazur sued the city for negligence in September 2013. Trucks reversing toward nearby loading docks repeatedly mowed down the curbside stop sign there, Villari charged in the lawsuit filed in the Philadelphia Court of Common Pleas. City workers responded by relocating the sign – to the middle of the sidewalk. But trucks continued to knock it down there, “leaving well-anchored shards of twisted metal in their wake,” Villari wrote in the complaint. The city settled the case last August, paying Mazur $300,000, according to city records. Mazur also sued the PIDC local development corporation and the packaging firm whose loading docks generated the truck traffic; both settled for an undisclosed amount. It was the city’s biggest pole-stump settlement in the past 18 months — but one of four that resulted in six-figure payouts, city data shows. Pole stump injuries probably are more prevalent than city settlement numbers suggest, attorneys agree, because the city is only secondarily liable for such injuries (primary liability lies with the property owner). And the law requires plaintiffs to prove permanent injuries to recover damages. The city Streets Department is responsible for installing and maintaining many of the thousands of street signs you see on the city’s 2,500 miles of streets. Workers replace about 4,500 a year, said Mike Carroll, the department’s acting commissioner. But to Brad Cooper, that’s a strategy sure to leave pole stumps and other such hazards in place. Cooper, an attorney, represented Toni Goodwin, who was heading to her car one night in February 2013 after attending a wake in Nicetown when she tripped over a 2-inch iron stump outside the Triumph Baptist Church. She went sprawling and ruptured the quadriceps tendon in her thigh, which required surgery to repair, Cooper said. Investigating the case, Cooper found that the stump had been there for years. He sued on Goodwin’s behalf the next year, and the city paid $110,000 to settle the case, according to records. Pole stumps aren’t the only streetscape defect resulting in lawsuits that have proved costly to taxpayers. People sue the city over everything imaginable, including manholes, potholes, bridges, ditches, cave-ins, curb cuts, concourses, sewers, storm inlets, street defects, demolitions, escalators, excavations, fire hydrants, line striping, water mains, medians, playground equipment, park trails, trees, trolley tracks, and traffic lights and signs. Altogether, complaints over those things cost the city almost $14 million in lawsuit settlements in the past year and a half, according to city records. The costliest categories were street defects ($3.3 million), potholes ($2.5 million), and storm inlets ($1.9 million), city data shows. Many such problems sprout from aging infrastructure, Carroll said. You might think injuries and lawsuits would send the city scurrying to fix problems. But repairs rarely happen immediately. And sometimes they don’t happen at all. Eric Thompson was dropping his teenage grandson off at Cherashore Park in Fern Rock in August 2012 when he stepped into a depression beside a storm drain, where his foot became wedged as he got out of his car, according to a lawsuit he later filed. He fell over and broke his ankle and tore several ligaments, injuries that led to two surgeries and more than 150 doctors’ appointments, his attorney Jordan S. Namerow said. 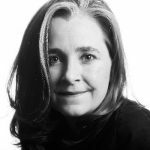 Thompson sued the city in 2014, and the city in January agreed to settle the case for $250,000, records show. 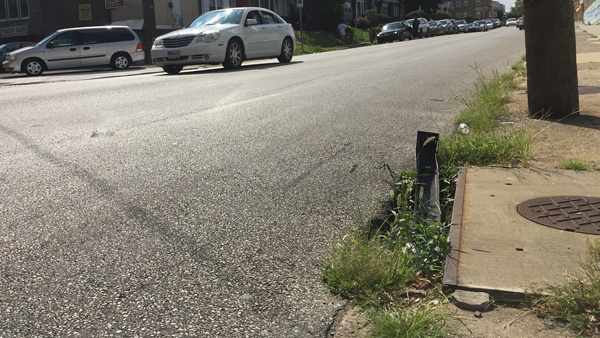 Though it’s been four years since Thompson was hurt and seven months since the settlement, the foot-swallowing ditch at Wagner and Olney avenues that prompted his lawsuit remains unfixed today. The gap is wide and deep enough that a bumper and other trash have collected there beside weeds sprouting from cracks around it. “The fact the substantial defect that caused my client’s injuries remains untouched without remediation illustrates the endemic problems the city faces with inefficiencies and a lack of simple safeguards,” Namerow said. Carroll, who took over the Streets Department in May, wasn’t familiar with Thompson’s case and couldn’t explain why the ditch hasn’t been fixed. But it sometimes takes time to suss out who’s responsible for signs, streets, sidewalks, sewers and other public properties that could belong to agencies ranging from the state Department of Transportation to SEPTA to the Philadelphia Water Department, Carroll said. Other times, it’s more a matter of ensuring the cure isn’t worse than the disease, he added. “We send a crew out immediately and we mark it, but we have to go through a utility clearance process,” Carroll said, explaining that workers must investigate what’s beneath the pavement before breaking out their repair tools. “We can’t just jack it out, because that could cause cascading emergencies to follow” if workers inadvertently create other hazards during the repair. The Streets Department currently keeps no comprehensive inventory showing when streets, signs, bridges and other streetscape features were built, last inspected, repaired and replaced, Carroll said. But officials aim to remedy that, with plans to create a “contemporary asset-management system” with data they could analyze to “become more predictive rather than reactive,” he said.